RLS Day is here again, with exciting events throughout the week leading up to Stevenson’s birthday on the 13th of November! This years theme is Crime. 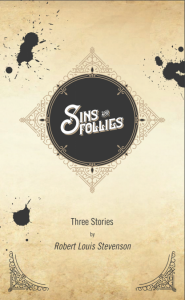 Why not immerse yourself in the dark side of Stevenson’s psyche by reading Sins and Follies, containing three sinister stories by Stevenson? The full list of events can be found at the City of Literature’s website. Don’t forget to share your experiences on social media using the hashtag #RLSDay, and don’t forget to check back here for the highlights!